Today I have Patricia Elliott on the blog introducing her newest book’s main character and how the character came about. This coincides with the publication of the book, The Devil in The Corner, which came out today from Hodder Children’s books. It is hard sometimes to know whether the plot or the characters came first when you have finished writing a novel. The plot of The Devil in the Corner and its main character, Maud Greenwood, more or less happened together. I knew I needed someone who was vulnerable, who had had a troubled past and carried a burden of guilt. So Maud was born and in many ways she had been waiting to be born for a long time. She is probably the most complex character I have written and she came about like this. The teacher, about to retire, had once had a very good voice but now it was old and tired. However, something in the quavering timbre of his voice in the crowded hall perfectly suited the poignant, yearning quality of the song, and it transfixed me. I stored the memory away. I knew that it was important but I wasn’t sure in what way. I later learned that the song was very popular during the Victorian/Edwardian period and was adapted from a long poem by Alfred Lord Tennyson, the Victorian poet laureate. It is a curious poem, over-blown, heavy with sensuality and longing. The time I’d heard the song came back to me when I was starting to write The Devil in the Corner. I called my main character ‘Maud’ because of it – and because Maud is another form of Maeve or Mab, the Queen of the Fairies. I imagined Maud being fairy-like, with all the characteristics associated with fairies: tiny, delicate, devious but beguiling, wilful – even spiteful – capable of good or bad. John, the young artist, when he first sees her describes her as a fairy creature who has laid a spell on him. Her surname ‘Greenwood’ followed through association, I think. We imagine fairies in dark woods, heavy with leaf, peeping out from under toadstools, fluttering above fallen logs. When I was a small child I saw them in the Black Forest in Germany – or so I was convinced at the time, though now I think they must have been butterflies! 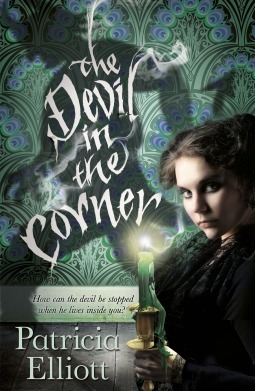 Maud Greenwood narrates much of The Devil in the Corner. She is not an altogether reliable narrator, although in fact everything she reports is true. But she does leave out quite a lot, things she does and thinks, that can only be pieced together at the end of the novel. She’s manipulative and untrustworthy, and I wanted the reader to be unsure of whether she is merely using John for the escape he represents or whether she really loves him. It takes a while before she admits the truth to herself and even then I think you might question it. Maud struggles to secure a future for herself but she has had a difficult past and been damaged by it. Her mother has died and her father, too, both in rather tragic circumstances. She blames herself for their deaths. As there is no money she is forced to leave school and find employment as a governess, aged fifteen. For the following two years she is subjected to hardship and abuse before she is finally offered a roof over her head with a cousin by marriage, a cousin who is living comfortably on money that should have gone to Maud. In the Victorian period it was not uncommon for girls from a middle-class background, like Maud, to be employed as governesses, even as young as fifteen, so great was the demand from the newly wealthy and their desire to appear posh to their neighbours. ‘Nicely brought-up’ girls, sent away to work because their own families had fallen on hard times, would find themselves appalled by the uncouth manners of the farming household that had employed them. They were often treated badly, given little to eat and slept in damp, mouldy rooms. But otherwise for a girl of Maud’s background there was no choice: it would shock society if they worked in a factory and keeping up appearances was important in those days. That left only marriage to offer financial security. That is, of course, how Maud sees marriage to Grenville Harcourt and she sets out to ensnare him deliberately. Many women married not for love but because the alternative was too grim to bear, as it is for Maud in my novel. So can Maud be blamed for her actions? And is she capable of murder to get what she wants? By the time you have finished a novel the characters are real to you. You have spent a long time with them, you would know them immediately if they came to the front door. If they were any of the characters from my other novels I’d welcome them in, give them a cup of tea, sit them down and catch up on their news. But Maud…? I’m not so sure. As that diminutive figure in her long black skirts stepped demurely into the hall, I think I’d feel a slight – chill. But then I’d look into her great, dark, sad eyes and, like John, be lost.